Osama bin Laden was not armed when a U.S. Navy SEAL shot and killed him during the raid two days ago in Pakistan, a White House spokesman said today, contrary to previous accounts provided by Obama administration officials. "He was not armed," spokesman Jay Carney said today while reading a revised narrative that corrects other errors from previous readouts of the operation that took the life of the world's most wanted terrorist. The new account changes the initial claim, later withdrawn, that bin Laden had used a woman believed to be his wife as a "human shield" when confronted by U.S. forces during the raid that began at 4:15 p.m. Sunday, Washington time. The updated version says "a woman -- bin Laden's wife -- rushed the U.S. assaulter and was shot in the leg but not killed." "Bin Laden was then shot and killed," the narrative adds at that point. "He was not armed." At a White House briefing yesterday, counterterrorism adviser John Brennan said that bin Laden "engaged in a firefight with those that entered the area of the house he was in. And whether or not he got off any rounds, I quite frankly don't know." Brennan also said bin Laden was "hiding behind women who were put in front of him as a shield." 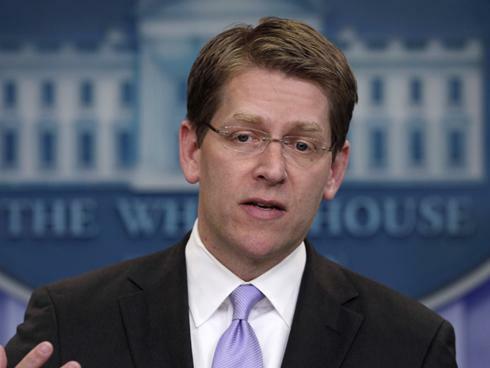 White House spokesman Jay Carney at today's briefing. Today, Carney said bin Laden resisted during the raid, adding "resistance does not require a firearm. "Asked about the changes of details, Carney noted that officials have hastily gathered "a great deal of information" in the 48 hours since the operation took place. 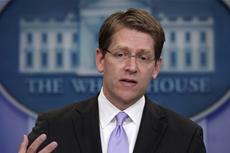 Carney said some information "came in piece by piece and is being reviewed and updated and elaborated on." The new narrative provided by the White House also provides details of bin Laden's burial at sea, done in accordance with Muslim traditions. On orders of the president, a small U.S. team assaulted a secure compound in an affluent suburb of Islamabad to capture or kill Osama bin Laden. The raid was conducted with U.S. military personnel assaulting on two helicopters. The team methodically cleared the compound moving from room to room in an operation lasting nearly 40 minutes. They were engaged in a firefight throughout the operation and Osama Bin Laden was killed by the assaulting force. In addition to the bin Laden family, two other families resided in the compound: one family on the first floor of the bin Laden building and one family in a second building. One team began the operation on the first floor of the bin Laden house and worked their way to the third floor; a second team cleared the separate building. On the first floor of bin Laden's building, two Al Qaeda couriers were killed along with a woman who was killed in cross-fire. Bin Laden and his family were found on the second and third floor of the building. There was concern that bin Laden would oppose the capture operation and indeed he resisted. Following the firefight, the non-combatants were moved to a safe location as the damaged helicopter was detonated. The team departed the scene via helicopter to the USS Carl Vinson in the North Arabian Sea. Aboard the USS Carl Vinson, the burial of bin Laden was done in conformance with Islamic precepts and practices. The deceased's body was washed and then placed in a white sheet. The body was placed in a weighted bag; a military officer read prepared religious remarks, which were translated into Arabic by a native speaker. After the words were complete, the body was placed on a prepared flat board, tipped up, and the deceased body eased into the sea.